Henry Thoreau was an especial friend of my father and mother. They spent the first two or three summers after their marriage at his mother's house in Concord. One afternoon the three were taking a quiet rowing trip on the placid Concord River, a diversion to which they were greatly devoted when, as they were approaching a fine old oak on the river bank, Henry ceased rowing, stood up suddenly in the tiny skiff, looked upon the huge tree with something akin to adoration and said, as one inspired, "Why, there is enough in that tree alone to keep one man happily busy all his life!" His face was alight with fervor as he went on to tell of the rich reward awaiting him who would take the oak-tree for his lifework. "The whole story of creation and all of natural history is in that one tree! Why does anyone want to take long journeys to study anything? It is all here." 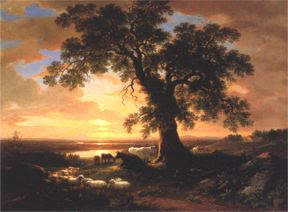 Asher Brown Durand, The Solitary Oak (New York, New-York Historical Society).